Indian tribal life has a colour of its own. With each region of the subcontinent teeming with its own tribes, and each tribe with a life all of its own, no other country in the world has such diverse tribal culture. Indian tribes inhabit rural pockets and have their own unique economy. Despite the fact that a lot has been done to assimilate them into mainstream life, they are known to keep their interactions with those outside their respective tribes to the minimum. It is no wonder then that in a world as alone as theirs, each tribe has evolved to have their own wisdom, spiritual practices, and art. The two-piece sculpture you see on this page is a fine depiction of Indian tribal art. Two folk musicians are seated next to each other. 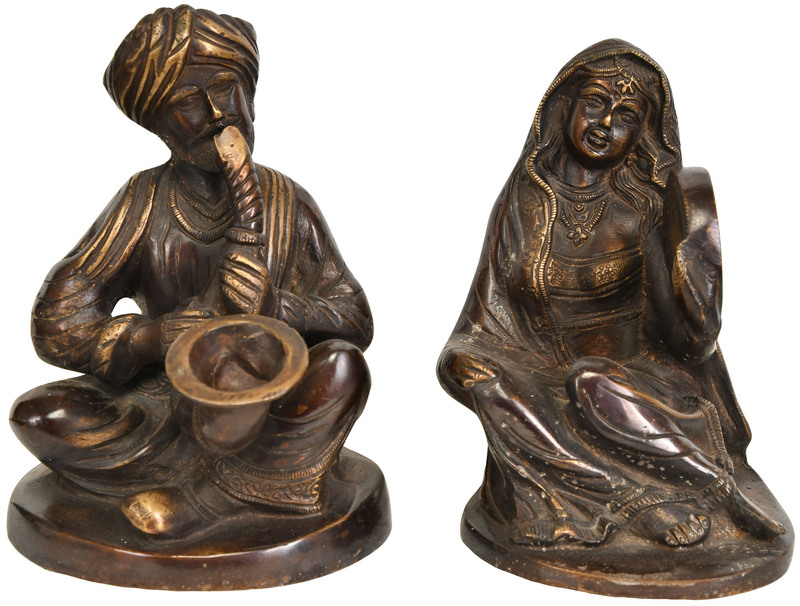 The man plays on a tribal musical instrument, while the woman breaks into song. They are probably father and daughter, the latter lovingly having been taught to sing by the former, and making music to celebrate the harvest season. Note the ample folds of his turban and dhoti and angavastram; the luscious lengths of her odhni and ghagra, designed to make up for the summery choli. They are both seated barefoot, which indicates that they consider music to be holy. Zoom in on the dynamic angle of the musicians' necks, the expressive lines that define their faces, the lifelike digits and drape of their garments.